In our modern world, it may seem like graphing functions by hand is...well…a bit archaic. When you can easily enter any function you wish into Desmos or Wolfram Alpha from the comfort of your phone, why should you learn to graph functions longhand? Especially the more complicated functions like the ones we encounter in trigonometry? Well besides the obvious likelihood that you are reading this because in some Trigonometry, Precalculus, or Calculus course your instructor is requiring you to graph sans technology, I’d like to present the argument that true understanding can only be gained through *doing*. The fact remains that you can’t learn math by standing on the sidelines. Math IS a participatory sport. You can read about math, listen to lectures, watch other people do math but if you don’t actually grab a pencil and paper and struggle through the problems, you will never learn mathematics. In a day and age where we so easily construe talking about doing things as actually doing things, math remains one of those disciplines that can’t be faked. If you are struggling to progress in math ask yourself if you are actually PRACTICING mathematics or are you thinking — or talking — about doing math instead? Alright, enough with the real talk. Let’s jump into sketching some trigonometric graphs! You’ve probably heard the term Parent Function with relation to graphing. Parent functions are the OGs of functions. They are the unaltered forms of your equations. The archetypes. For example, the equation y=x is the parent linear function; the equation y=2x+1 is still a linear function but it is not the parent function. It is an altered form of the parent where we have changed the slope and y-intercept. This idea of parent functions applies to all types of functions. In Trigonometry our main parent functions are: y=sin x, y=cos x, y=tan x, y=csc x, y=sec x, and y=cot x. These are the functions you will be primarily working with in trigonometry (although as you progress you might learn about other interesting functions such the inverse or hyperbolic trig functions). So these are the functions we’ll be learning how to graph today! These three functions are definitely the all-stars of trig. You probably remember these functions from geometry when you were first introduced to right triangle trigonometry. Although the graphs of Sine, Cosine, and Tangent may seem completely different from what you learned in geometry, we are really just experiencing a new picture of the same geometric concept. Sine, cosine, and tangent still represent SOH CAH TOA, but in trigonmetry, we learn about some new and creative ways we can represent this information. Essentially what we have done here is scaled our special right triangles so that their hypotenuse is 1 unit in length, organized them around the origin of a xy-coordinate plane, and traded out the concept of degrees for radians (which is just angles measured in respect to a circular rotation). When we lay out all these triangles around the origin, we can connect the outermost points to form a circle that has a radius of 1 unit. That circle is the Unit Circle and one of the most important topics in trig! Now the points the lie on the circumference of the circle can be translated into the graphs we’ll be exploring today. According to SOH CAH TOA, we see that the x-coordinate relates to the cosine value (output) at the given angle rotation (input). The y-coordinate relates to the sine value (output) at the given angle rotation (input). And lastly tangent can be defined as cosine divided by sine, so the quotient y/x is the tangent value (output) at the given rotation (input). Now we can graph a picture of this information that we gleaned from the Unit Circle, by creating a graph where the x-axis represents the rotation in radians, and the y-axis represents the value of our sine, cosine, or tangent functions at the given angle. As I’m writing this, I’m realizing that this is a complicated set of relationships to understand, so I’m going to put together a separate tutorial to explain how these concepts all relate, but until then bear with me! 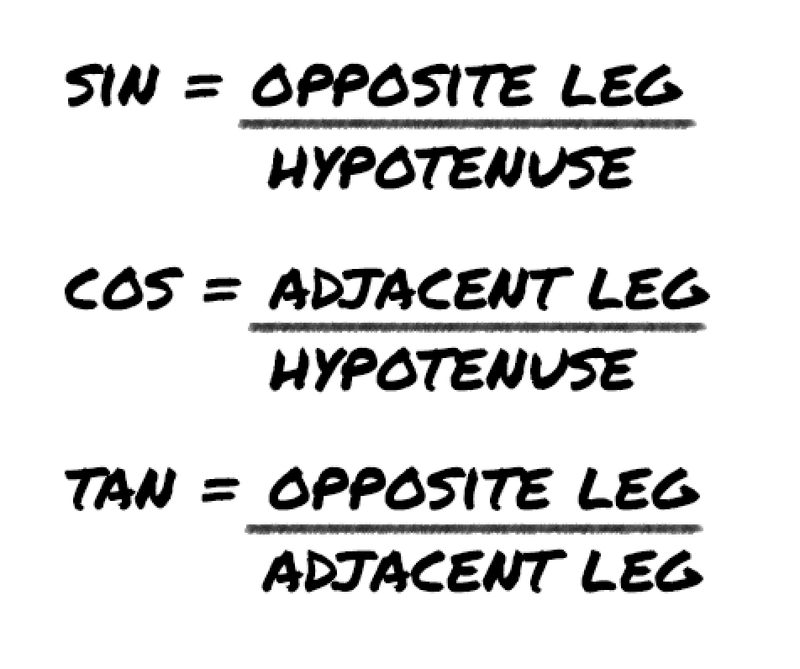 The other three functions you will encounter in basic trigonometry are Cosecant, Secant, and Cotangent. These functions are often referred to as the reciprocals of Sine, Cosine, and Tangent because they are defined by the reciprocal (ie flipped upside down) ratios of SOH CAH TOA. So now that we have learned about the six standard parent functions of trigonometry, we are ready to take a look at how we can manipulate the parent functions to create and sketch interesting graphs by hand — which is one of the main reasons why we need to know how to graph the parent functions by hand! In the following tutorial, I explain how we can alter a parent function to produce x and y-axis reflections, horizontal and vertical stretches, compressions and shifts. 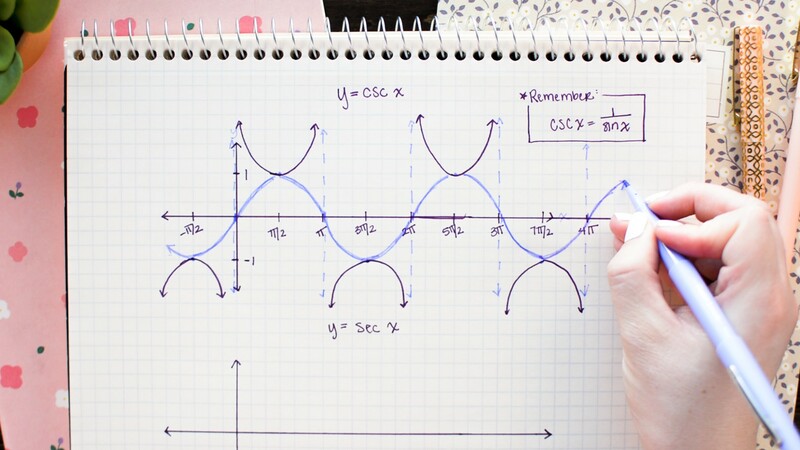 Skip to 14 minutes in to see three examples of graphing transformed Tangent, Cosine, and Sine graphs. Check out Math Hacks on YouTube for more hands-on math tutorials covering popular topics from Algebra, Trigonometry, Precalculus, and Combinatorics with new videos added weekly. You can find a number of interesting math topics and problems right here on Medium, just click that follow button!